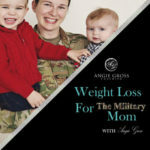 Welcome to the 7th episode Weight Loss For The Military Moms Podcast. The hunger scale is a tool that I use with my clients that helps them get back in touch with their bodies. What is your body trying to communicate with you? When you get in tune with your body you will lose weight 100% of the time.